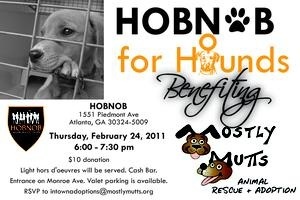 To Dog With Love: Help rescue animals across the U.S. with Pedigree and in Atlanta tonight with Mostly Mutts! Help rescue animals across the U.S. with Pedigree and in Atlanta tonight with Mostly Mutts! We love Pedigree for all they do for rescue animals and we love Betty White and adorable Yogi in this video. Like Betty White says, you can help the animals who need it most at PedigreeFoundation.org. And if you're in Atlanta, join us tonight at HOBNOB For the Hounds at -- where else -- HOBNOB Neighborhood Tavern where we'll be helping the doggies and kitties at Mostly Mutts Animal Rescue and Adoptions. Love animals & love Betty White! Good luck in Atlanta, Mostly Mutts!